Critical information remains hidden when traditional approaches allow overlapping peaks to go unresolved. Unidentified overlapping peaks in your spectral peak lists deliver lower mass and abundance precision. Poor mass precision makes it harder to correctly identify isotopic series or charge states and widens the mass error that you must consider in peak identifications. Abundance errors produce spurious biomarker candidates and incorrect isotopic ratios for peak identification. Precision problems in your data waste valuable time and precious samples. Worse, they can misdirect and decrease the effectiveness of your R&D efforts. PeakInvestigator software helps you do better science with less time and money. It can increase your mass analyzer's effective resolution by 3-4x. PeakInvestigator can reveal and precisely deconvolve overlapping (nearly isobaric) peaks that your current mass analyzer and software cannot. PeakInvestigator software delivers up to 10-fold improvements in mass and abundance precision across a wide dynamic range when deconvolving previously hidden overlapped peaks. It uses statistically robust and reproducible methodologies. 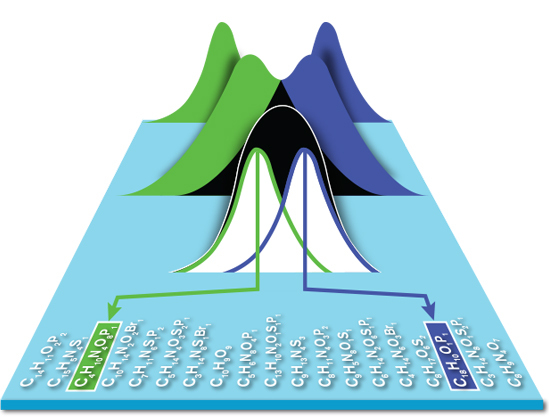 PeakInvestigator's ability to reveal hidden peaks enhances identification of unknown proteins, peptides, and metabolites, which improves your ability to correctly detect and validate biomarkers. View benchmarks illustrating these improvements: 3-4x Resolution Increase. PeakInvestigator software minimizes user, run-to-run and instrument variability with advanced signal-processing algorithms that automatically adjust for differences in instruments and tuning variations. These algorithms provide locally adaptive baselining and signal-to-noise thresholding. These advanced methods eliminate the need for manual estimation of centroiding parameters or visual inspection of data before processing. PeakInvestigator algorithms use statistically valid and reproducible methodologies that determine statistical confidence intervals for every peak assignment. PeakInvestigator is designed to be 21CFR11 and HIPAA compliant upon commercial release, and a natural choice for regulated activities. PeakInvestigator is a software-as-a-service solution. Our simple public application-programming interface (API) inserts directly into your mass spectrometry workflow. Your validated workflow remains intact, while you leverage PeakInvestigator algorithms on your data. MZmine PeakInvestigator™ Edition incorporates the PeakInvestigator API into MZmine 2, a popular open-source mass spectrometry workflow platform. PeakInvestigator Direct Access offers a user interface directly from your browser that allows you to upload and process individual mass spectrometry scans through the PeakInvestigator™ software services. Please explore the capabilities of PeakInvestigator software services through MZmine PeakInvestigator Edition or PeakInvestigator Direct Access, and ask us about incorporating PeakInvestigator software services into your mass spectrometry workflow.